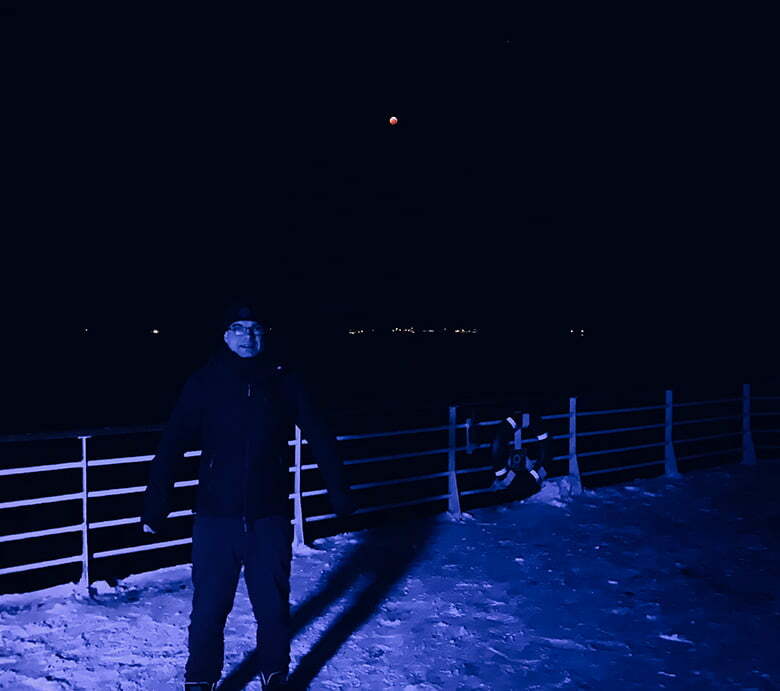 Hurtigruten Diary Day 10: A sensational view of the blood moon was an unexpected highlight of the trip as we crossed the Arctic Circle southbound and sailed down the Helgeland coast. It's a great feeling to have the sun back. 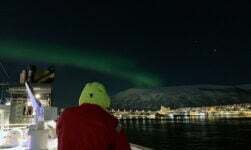 Not only does it give you a lift mentally, it lights up the Norwegian coastline, which is the whole purpose of the trip. As I wrote in my update yesterday, some of the American passengers I've got to know told me about the blood moon. I was skeptical, as happens when you've been away from news for so long, but a quick google confirmed that Scandinavia was indeed one of the best places on earth to witness the phenomenon. I so nearly didn't see anything. As my alarm blared at 5.35am I was an inch away from burying my phone under a pile of clothes. In the end, common sense won out with a “I'll quickly see if I can see anything, and if not I'll come straight back down” attitude. My first reaction that lasted a couple of seconds was one of disappointment. 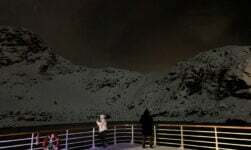 I saw a completely dark sky with bright stars in every direction, along with a small group of enthusiasts on deck. If these guys were on deck, there must be something to see! As soon as I saw the moon, my disappointment in realising my 5.35am wake-up was indeed going to last, disappeared. 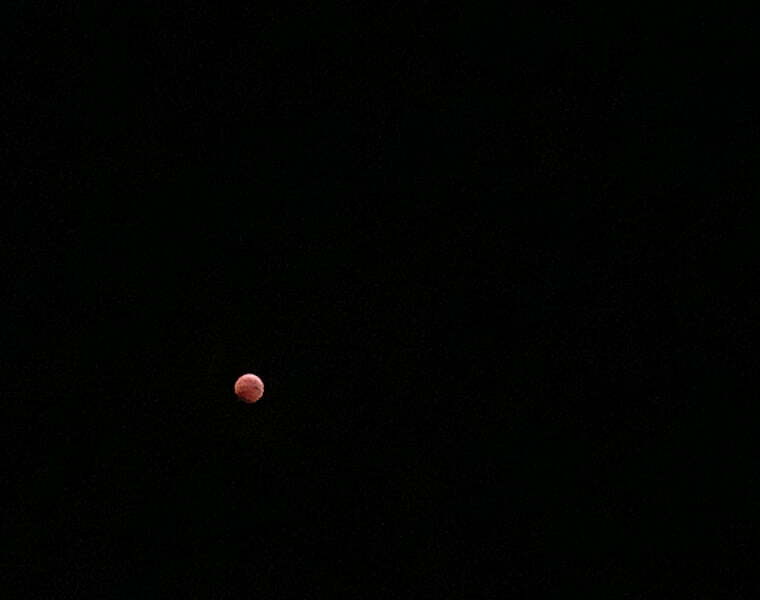 The super moon was stunning, and its gradual transition into eclipse and the ‘red effect' is a memory that will stick with me for a long while. I even managed to get some snaps. Much like the northern lights, while these aren't the best photos, they are my photos and therefore a much more powerful memory for me than what I can find on the news. It was also a great moment up on deck with a variety of guests, all of whom seemed thrilled to be sharing such a unique experience. After a very early breakfast with my fellow moongazers, I grabbed a quick nap. I was limited to an hour, as we had re-crossed the Arctic Circle that morning and I didn't wan't to miss the ceremony. Especially after all the fun and games of last time! 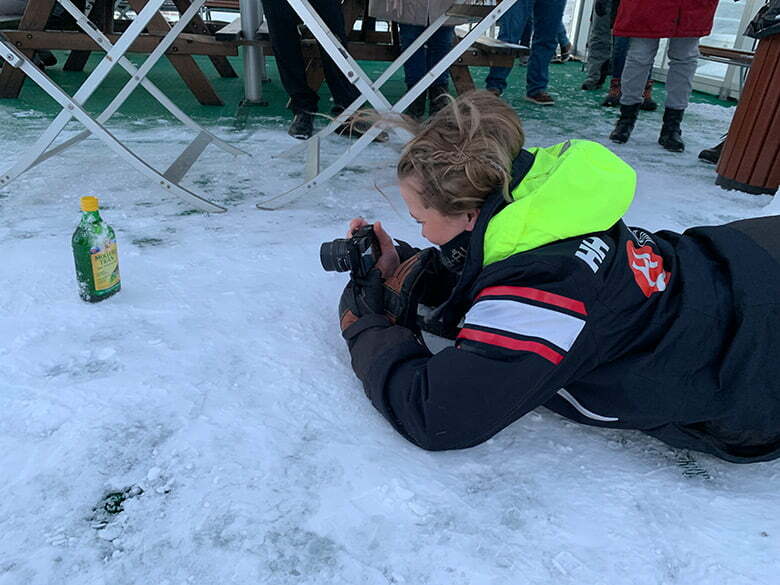 This time around there was a more low-key ceremony led by the Hotel Manager who did a good job introducing the cod liver oil and its importance to someone growing up in Norway. 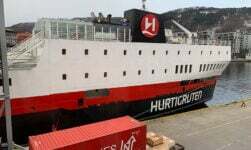 As someone who had been given cod liver oil as a child, it was no problem for me to join the queue for a dose in order to receive a special Hurtigruten spoon! 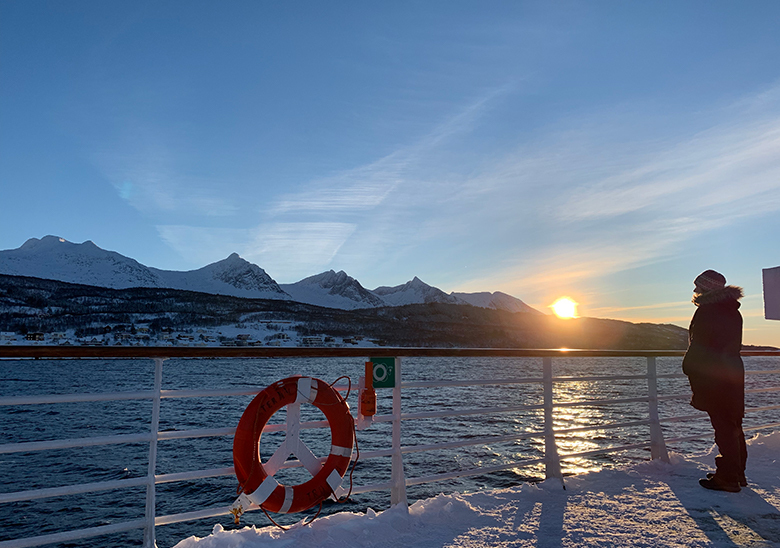 Whether it was the reduced numbers on the southbound leg or the return of daylight, there was a pleasant atmosphere on deck this morning. 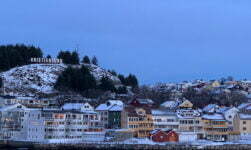 People were happy, smiling, and mingling as we sailed along the Helgeland coast before, during and after the ceremony. 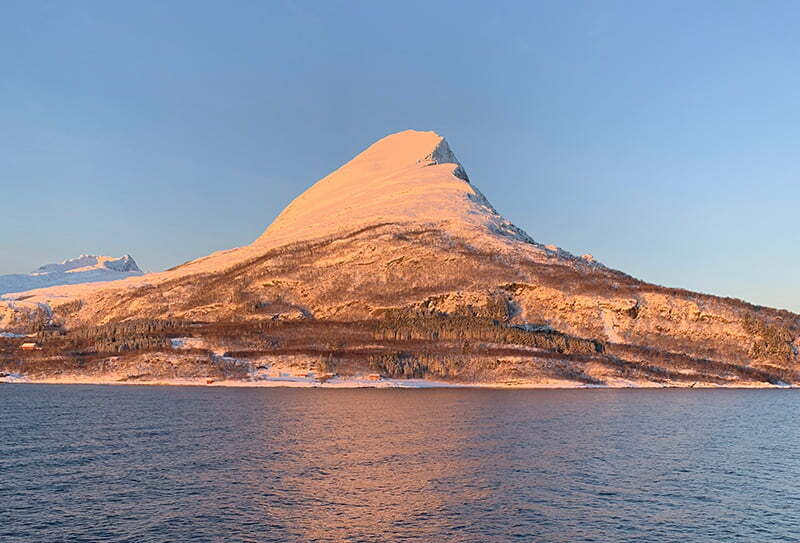 After lunch, we sailed past the famous Seven Sisters mountains – De syv søstre in Norwegian – just as the sun was peeking over the top. Perfect. The panorama lounge and deck were busier than they've been in days as people took the opportunity to enjoy some eye-catching scenery in daylight. 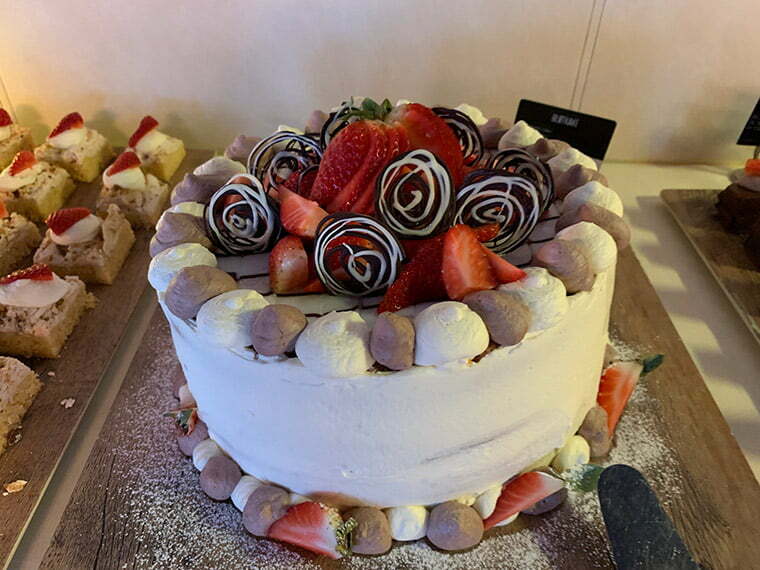 If you have ever wanted the opportunity to try traditional Norwegian cakes, this is the voyage for you! 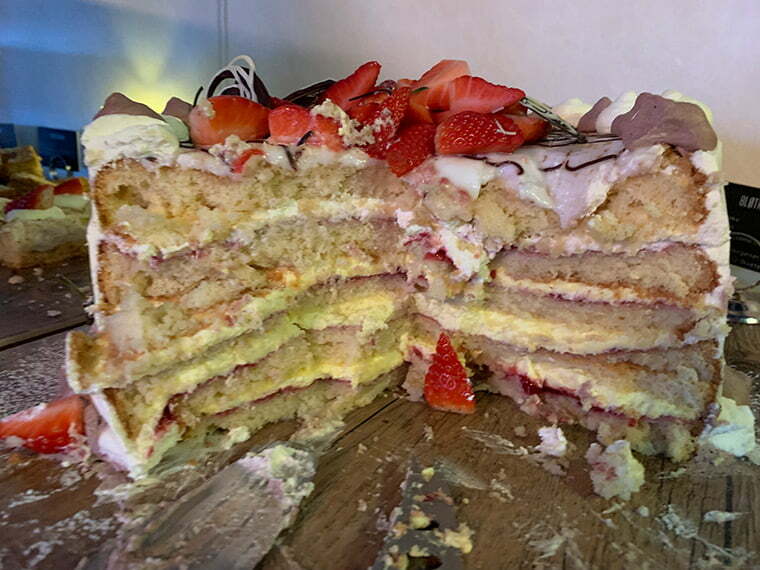 Two days ago Kvæfjordkake was available on the buffet, while today it was the turn of Bløtkake, a giant cream cake. I should point out that this was the lunch buffet! A dessert is served with the evening three-course dinner, so you might think people wouldn't want a dessert at lunchtime also. 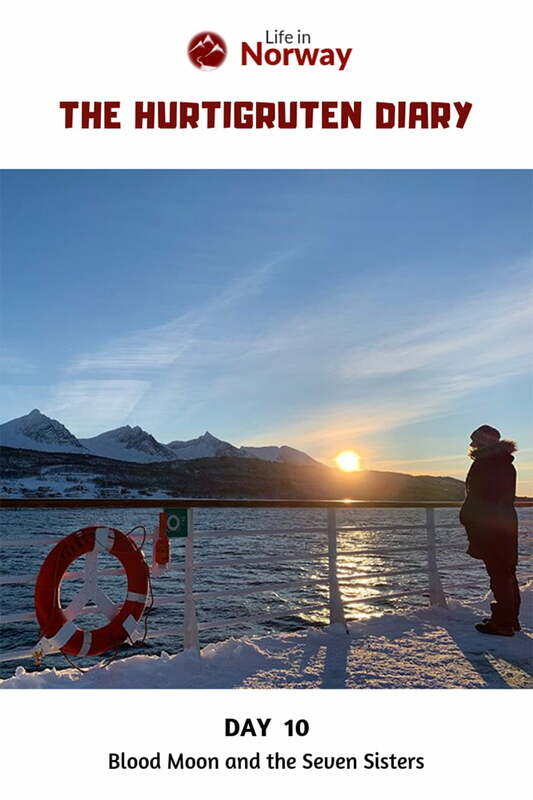 There might be a fitness room on board, but you sure don't lose weight on a Hurtigruten voyage! As many people will be leaving us at Trondheim, we had a farewell drinks reception before dinner this evening. It was a bit of a let-down if I'm completely honest. Once the hotel manager gave a very brief toast, the room then anticipated more speeches and the senior officers mingling with the guests, but all they did was talk amongst themselves before walking out early to the restaurant. Germans, Norwegians, Brits and Americans all told me they were thoroughly confused. Personally, I think this is simply cultural differences (I've written before about the question are Norwegians rude?) 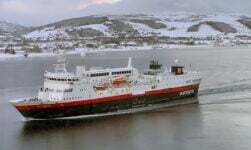 but many guests who have paid tens of thousands of kroner for this voyage simply felt ignored. 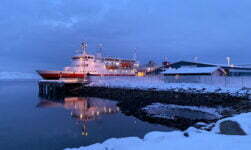 I don't want to give the wrong impression here, as I have thoroughly enjoyed my time on the MS Vesterålen. But I do have to wonder if there is an underlying conflict between the local ferry and cargo history of the line, versus the more modern marketing-oriented cruise direction of the line. I know members of the crew are reading my diary, but it's important to talk about the negative side of the voyage too. Many guests simply felt ignored tonight, and as we are almost at the end of the voyage that is a memory they will take away with them. It was a disappointing end to day 10 in what has otherwise been a fantastic experience. The dinner, by the way, was excellent as usual! 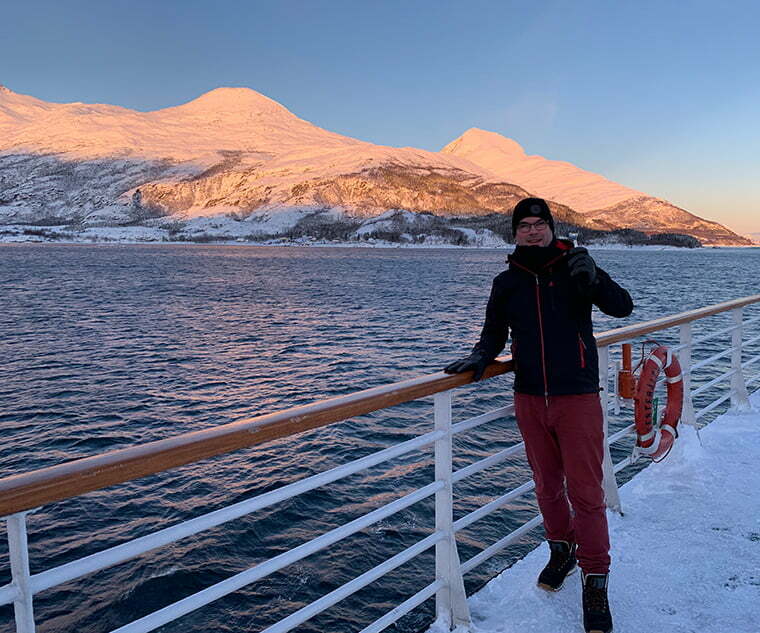 I must also thank the Tour Manager's assistant who gave me a guided tour of the ship today, as requested by members of the Hurtigruten Friends Facebook group. I need a little time to edit the video, but I promise it's coming! Thank you for this brief synopsis of your voyage. 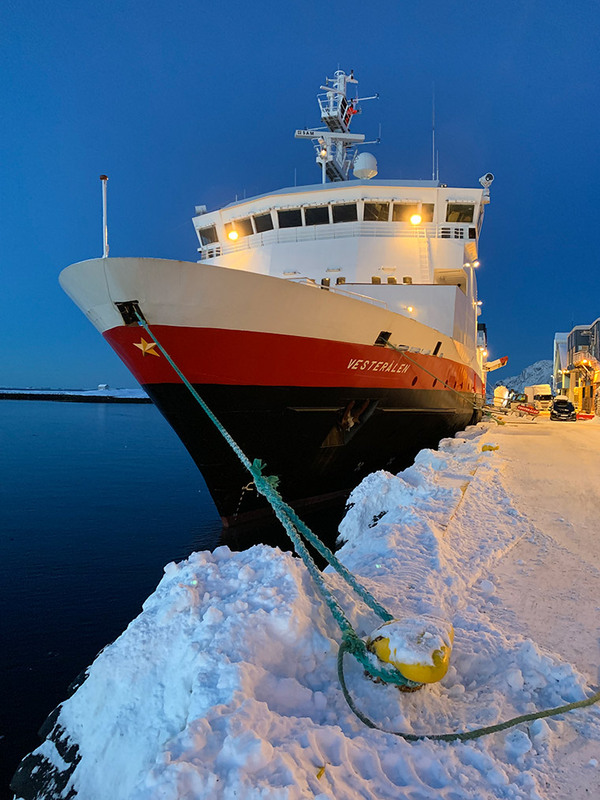 We are two of the lucky few who are going to take this voyage in February 2020 on the upper deck and just hope we are not ignored in any way. Still, I’m sure we’ll not forget the positives- ever.